Share the post "Happy Easter 2014!" This is the day in which we formally consider it appropriate to celebrate the arrival of Spring. The new Easter outfits were seen all around town today. Each Christian denomination arrived at their respective churches and celebrated the rising of Christ from the tomb. I was pleasantly surprised to see so many people out and and about this morning. It’s good to see our community spiritually active. The coming together and sharing faith helps to nurture the spirit of community. I noticed several interesting things these past days that I thought I would share with you. This past Thursday, I was driving to the bank to make a deposit and to my complete surprise, I saw two Canadian geese perched on top of one of the downtown churches. They were just perched there looking below at the hustle and bustle of commerce. I couldn’t get back to the office fast enough to get my camera and take a photo. Just as I was coming back around the corner, they flew off. I have absolutely NEVER seen geese perched on roofs of homes or buildings. I have a plant in my office that has been growing for two years and hasn’t bloomed. It should have bloomed last year but didn’t. I stopped by the office this afternoon for a minute and just happened to glance over to that potted plant and noticed it blooming. Wow! What a great Easter gift. 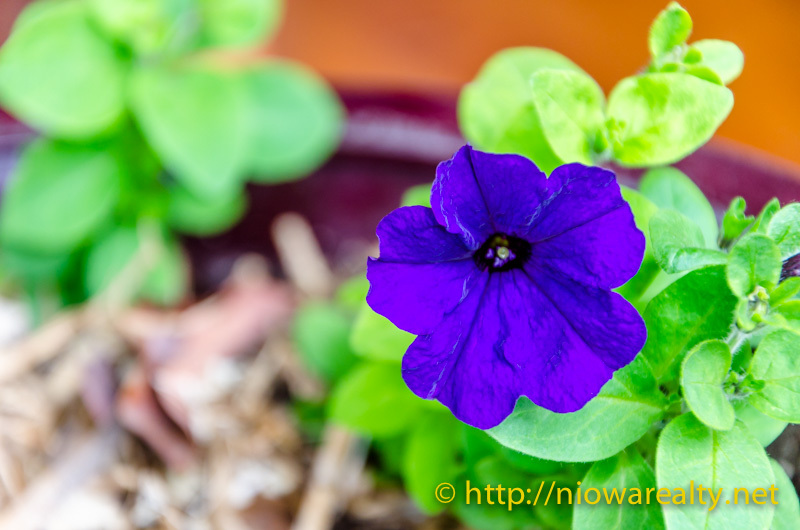 It was certainly worth the wait to find the deep violet color of the flower. Such a coincidence for it to decide to bloom today. After the horrendously long and bitter winter we’ve had, I can certainly say we are due for a very pleasant, happy, and prosperous six months ahead. From my heart, I wish each and every one of you a blessed and happy Easter season.